ZWR sources indicate that the Eagles have formally decided to redshirt rookie defensive end Vinny Curry this season. Drafted in the second round out of Marshall, Curry initially impressed team officials in offseason workouts and training camp. 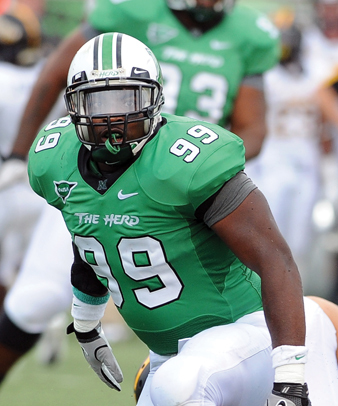 It wasn't a complete shock- the defensive end finished his career at Marshall with 26 sacks and was named Conference USA Defensive Player of the Year in 2011. A personnel executive quoted on the condition of anonymity noted, "It's just a numbers game, frankly. You've got Tapp and Hunt as the depth guys, Graham's a first round pedigree, plus all-pro studs like Babin and Cole in there. Where's this kid gonna play? And with so much on the line, it's kind of a no-brainer." Beyond depth, the organization also sees this season as a prime opportunity for Curry to acclimate himself to a winning environment and become accustomed to the rigors and structure of a professional coaching staff. With the decision made, Curry's eligibility will commence with the 2013 season. We expect big things from the redshirt rookie. Fantastic! Now you gotta do a medical redshirt for Danny Watkins.